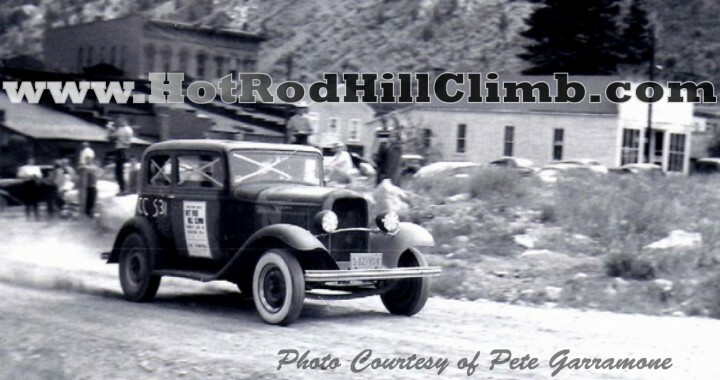 This is a short Photo essay on T-33, the Hot Rod Cal Kennedy and Don Scroggs campaigned during the 50’s at drag races and the Hot Rod Hill Climbs. These photos are posted on our Instagram page, seach #t33build for more photos. 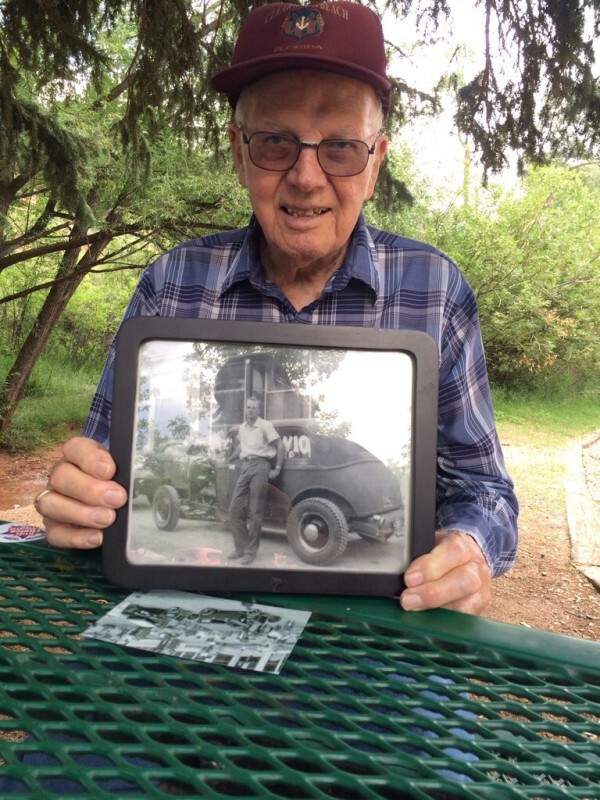 While investigating the Hot Rod Hill Climb in 2013, I met Cal Kennedy, he was at both the 1953 and 1954 Hot Rod Hill Climb events. His racing partner was Don Scroggs at those events, Don has been gone many years now, but his son Dave runs in our local hot rod circle. Cal Kennedy downtown Georgetown getting ready to take on the hill. 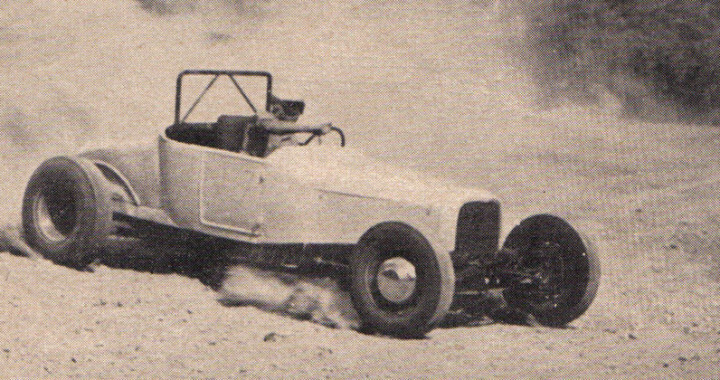 This photo by Ted Spencer was in Hot Rod Magazine March 1954. 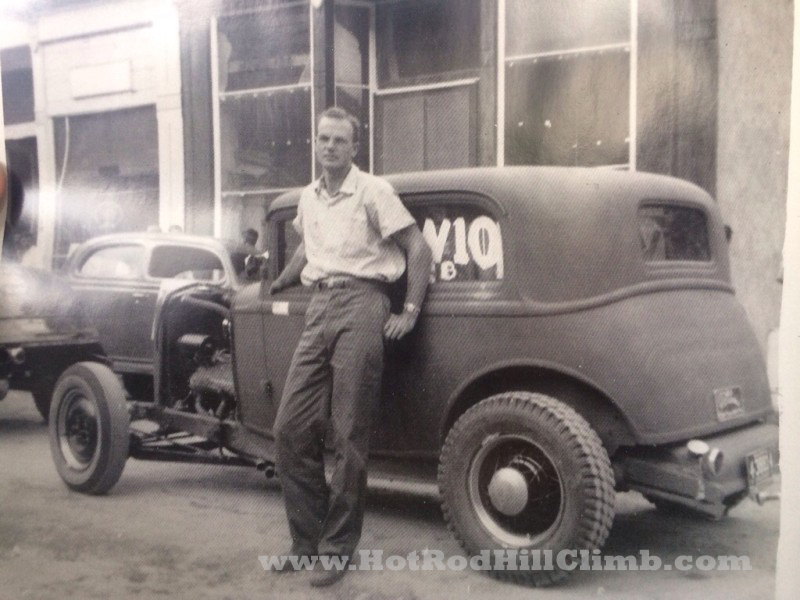 Don Scroggs taking on the climb in the now Wayne powered Roadster. 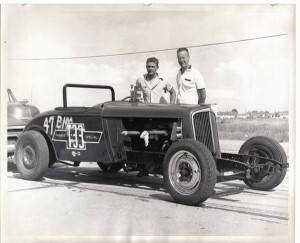 This photo by Ted Spencer was in Hot Rod Magazine April 1955. 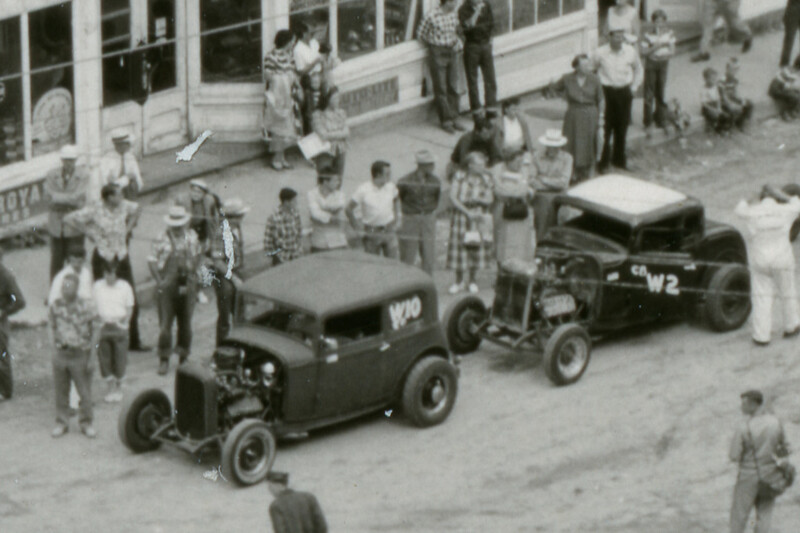 Photos from Cal’s scrap book, the top is at the dirt drag strip that the Colorado Springs Cam Winders club ran in the 50’s. I had this crazy thought that T-33 should be recreated again, and with the help of Dave Scroggs, Tom Wentworth, Phil Trill and so many more, the car has started to take shape. 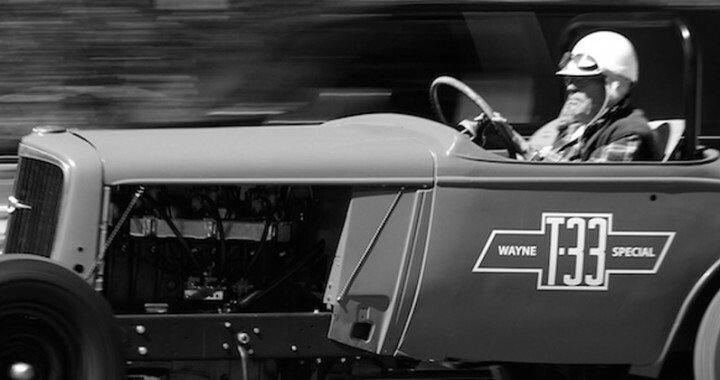 Cal and his friends rallied with Encouragement and Support to get the old Wayne motor breathing again. Cal and his life LuAnne brought the Wayne motor to Nick’s Garage so Mike could put it in the chassis. The State of the car 3 weeks before the 2014 Hot Rod Hill Climb, Cal came to take a look and tell us some stories. The Before and After progress shot of what we started with and what we have now. You can also check out the T-33 Fan Page on Facebook. This adventure just keeps on giving. 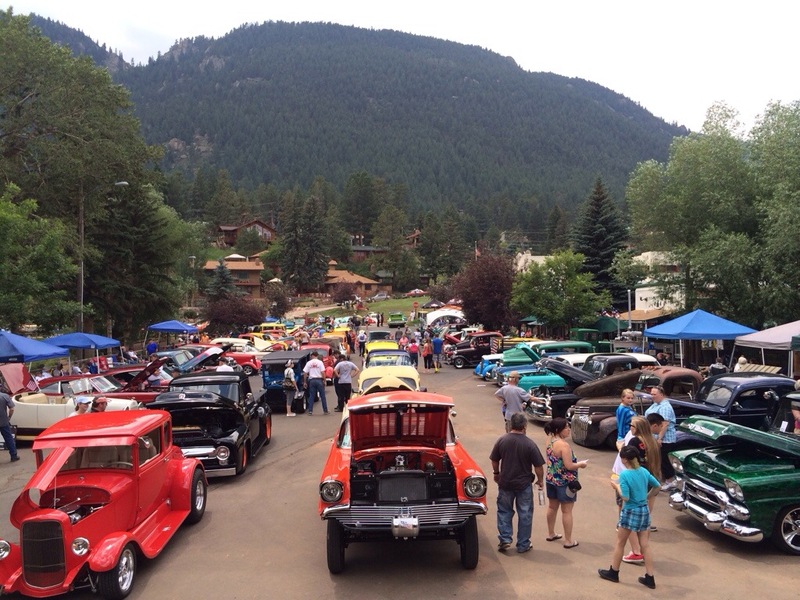 Saturday July 19th I took my mother, in town from California, and my two boys to Green Mountain Falls, west of Colorado Springs, for the Thin Air Nationals. 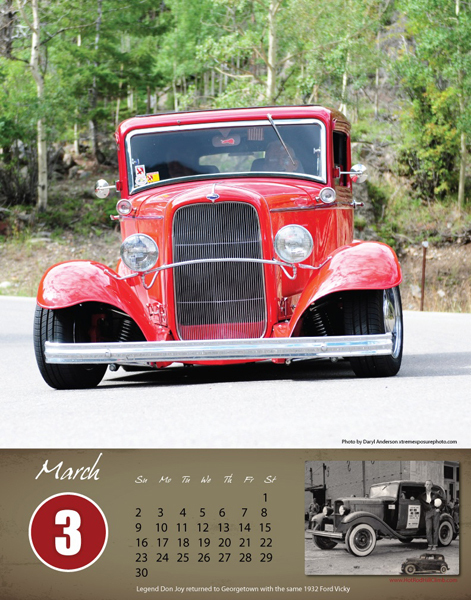 This was the 35th Annual event hosted by the Colorado Springs Rod and Custom (CSR&C) car club. These guys also staff the NSRA event in Pueblo, so they now how to put on a good show. We stepped into the Pantry for lunch and Brain Anderson of the CSR&C spotted me. 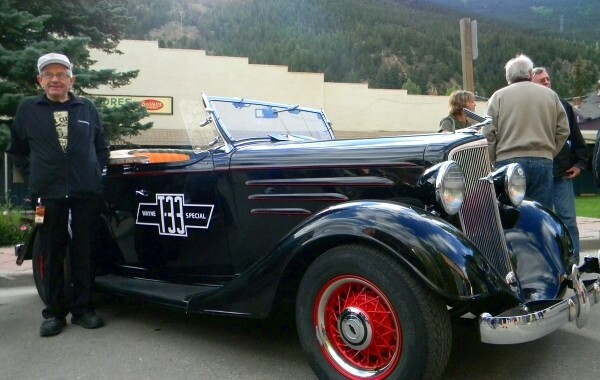 Brian and the club are HUGE supporters of the Hot Rod Hill Climb, he and the CSR&C club ran the tech inspection last year, and will do it again this year, along with hosting the Valve Cover Races (more here). Brain grabbed a stack of HRHC post cards and ran out the door, but before I sat down he was back! He had two very tall men behind him. Before I tell you anymore, I want you to know, I’ve been working really hard to round up as many living HRHC legends as I can, I’m going through old photos, programs, results etc to get names with faces and track these guys down. 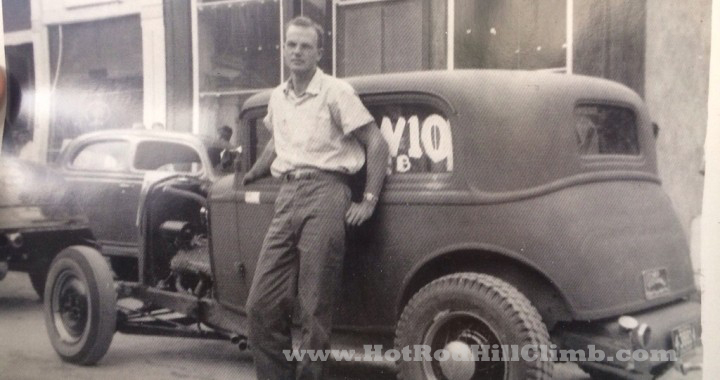 There were two Vicky’s at the Hot Rod Hill Climb in 1953, Cotton’s fender-less one, and of course Don Joy’s with full fenders. What I found ironic is that the only photos I have with proud drivers posed in front of their Hot Rod’s, are the Vicky’s. 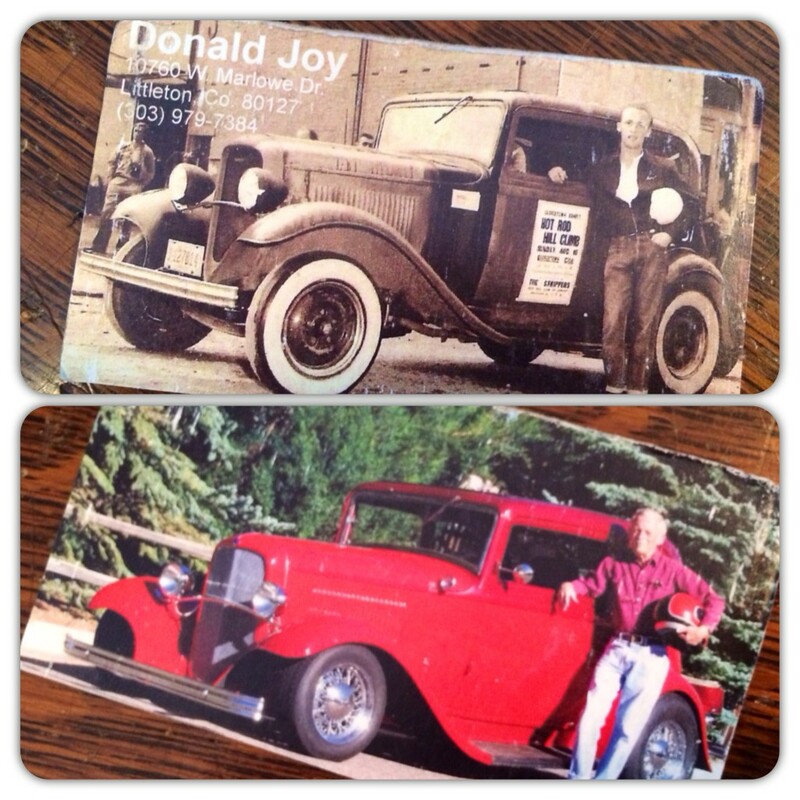 Don proudly shared this photo on his business card (seen below). After lunch we sat under the trees and I showed them the photos so many have shared with me. While going through the album, I had this photo (below) that I gave to Cotton, Dann commented on the two boys sitting on the wooden sidewalk (upper left), “That may be my brother and I, we were there as a family with my mother too, I think I was 5 at the time”. Only a magnifying glass and a fortune teller could tell us for sure, I like the story and that’s the way I’m going to tell it! In the case you don’t know, the ‘W’ stood for Cam Winders of Colorado Springs, and if you noticed the photo above, Cottons plaque is mounted on the body above the fuel tank. 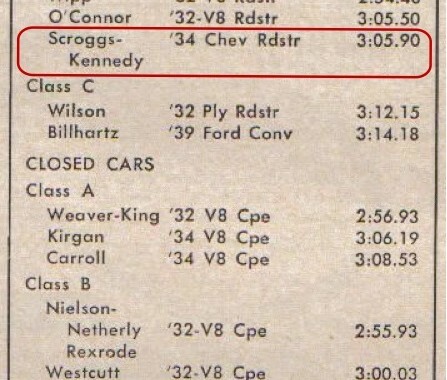 The W2 car is that of Doug Cimino who would come back in 1954 with Ardun heads on the same coupe. 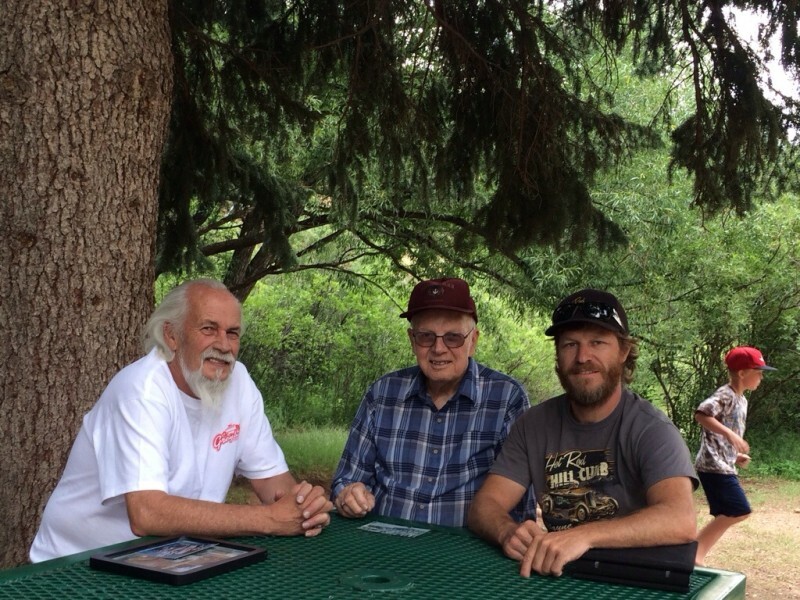 It was a pleasurable afternoon, and of course I encouraged them to come to the tribute 60th Anniversary Hot Rod Hill Climb event September 13th, 2014.